Shilla Kim-Parker wants you to save money—and the planet. That’s why she started Thrilling, an online marketplace for vintage and secondhand clothing stores. Shilla saw a disconnect between her favorite shops and the shopping method that best fits her lifestyle, so she filled the void herself. Here, Shilla shares how she made her dream a reality, how Thrilling is working to better the planet, and the advice she has for other women of color in business. How did you come up with the idea of Thrilling, and how did you transform that idea into a reality? The goal of Thrilling is to make secondhand shopping more popular, modern, accessible, and most importantly - more of a habit for more people. Secondhand shopping has always been near and dear to my heart. Not only is it a treasure hunt, but growing up in a household with limited means, it was a great way to find unique and fantastic clothes at a great value. It’s also one of the best ways to reduce your environmental impact and support local business owners. Win-win-win. As I’ve gotten older - I’m now a working mom, with a toddler at home and a baby due in just a couple weeks - I no longer have the time to shop in this way. Secondhand shopping is about the journey, it’s a fun afternoon or weekend activity - but I found that I no longer could dedicate the time to sift through racks. I yearned for a way to shop these stores from the palm of my hand, in the few spare moments I have between meetings or on the couch post kids’ bedtime. And that’s how the idea of Thrilling was born. Tell us a bit about how your business model works. How does Thrilling support small businesses? There are more secondhand stores in the US than there are Starbucks and McDonalds, combined. These stores are mostly run by women, who are typically the sole breadwinner for their families. All together they do about $15 billion in sales, but 95% of these sales are completely offline. 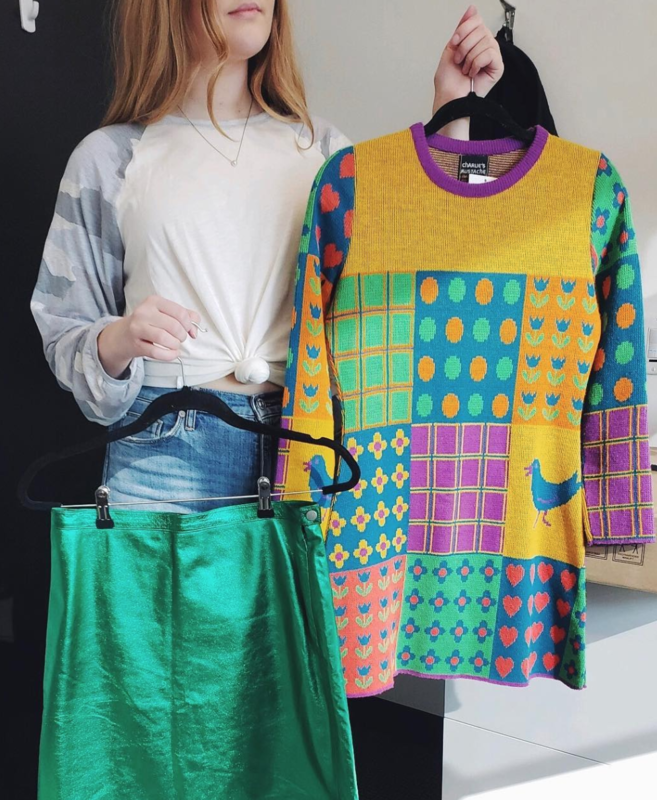 The thing that makes secondhand shopping so much fun - the fact that every item is unique - makes it extremely difficult for e-commerce. The amount of work involved is huge, which is why most of the current e-commerce platforms don’t work for these store owners. And yet, these store owners feel enormous pressure to go online, as relying on local foot traffic for business no longer pays the bills. That’s where Thrilling comes in. We do all the tech and logistics for these store owners and put whatever items they want online. We create a custom page for them on our site, which they use that page as their website. Now they can finally sell to customers across the country or around the world. What are the environmental implications of your company? It can take up to 1,000 gallons of water to make a single item of clothing. New apparel production is a leading contributor to pollution, and Americans wear clothes on average 7 times before throwing them in the trash. Worse, clothes are not easily biodegradable. Buying an item of clothing secondhand reduces its waste impact by nearly 75 percent. In this day and age, when the environmental issues facing our planet is an urgent crisis, shopping secondhand is a fantastic way to do our part. What advice do you have for other women of color looking to start businesses of their own? I am black, I am the daughter of a Korean immigrant, I am a mom, I am pregnant, I am (was) mid-career. Needless to say, Silicon Valley did not know what to make of me! For my fellow women of color - Perseverance! Many people will tell you “no" or “you can’t.” The standards you’ll have to meet will be higher. There are institutional barriers in place that will prevent you from getting funding as easily as others. But keep fighting. We need you. Our society needs your leadership, our community needs your representation, our economy needs your businesses. The real problem is that people from underrepresented backgrounds face greater risk in starting a business - usually we don’t have the same family resources, the same networks, the same access to capital others do. So my real advice is for those in positions of power - be a part of the solution, be an agent of change. And especially help women of color in the very earliest phase of their company/idea building process. What are you most proud of within your work at Thrilling? Giving back is built into our ethos. And we are proud to incorporate community service and outreach whenever and wherever we can. As an example, we are delighted to be partnering with Goodwill Southern California on “best of Goodwill” collections that will be sold exclusively on our site. The first collection goes on sale March 15th, and it is curated by Ali Mandelkorn, Janelle Monae’s genius stylist. The majority of the proceeds go towards Goodwill SoCal’s incredible workforce development programs, in particular job training and assistance for the homeless. We have been (happily!) overwhelmed by the response and demand from local vintage and secondhand store owners, from across the states and even as far away as Japan and Sweden. So we will continue to quickly ramp up the number of store partners we work with and the number of cities that we operate in. We are also working on some fun and innovative partnerships with artists, celebrities, and designers - stay tuned for more on that front this spring!